Origin and Habitat: 55 km East-South-East of Otjiwarongo, Namibia (Type locality). Habitat and ecology: This species occupies a unique habitat on the Great Waterberg, where it receives some 600 mm of rain per year. The plants stand directly on the little gneiss bank, in a bed of gneiss less than 2cm thick, on a slope so that surplus rainwater can run off. 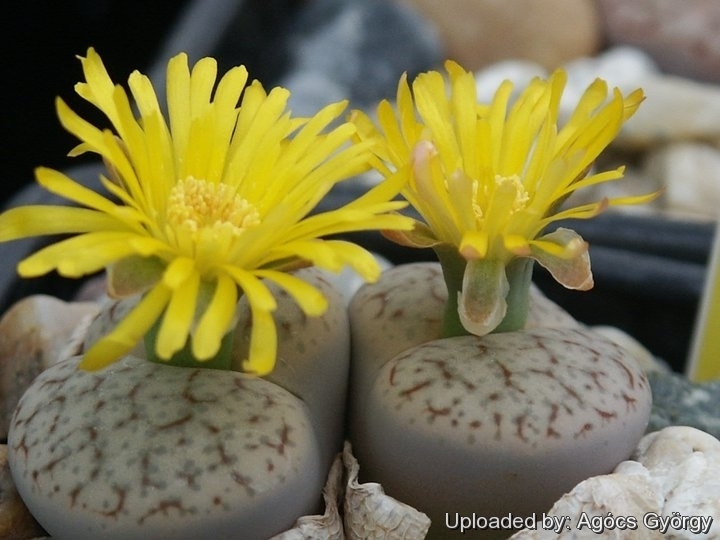 Description: Lithops pseudotruncatella var. elisabethiae is a local or morphological form of the widespread and variable Lithops pseudotruncatella. The var. elisabethiae is quite similar to the standard variety but with a peculiar bluish-pink colour. Plants are robust, but rarely feature more than two large heads. The face is reddish-pink, or coppery (Triebner "bright brick red"), semi-glossy, with red lines. The windows sometimes appear as blue wavy shadows. However the distinguishing characteristics of Lithops pseudotruncatella var. elisabethiae, appear to fall within the natural variation of Lithops pseudotruncatella and it should be synonymized with the latter, but it still has a value for a collector because they identify plants with particular characters. Derivation of specific name: Named in honor of Elisabeth (not "Elizabeth") Schneider, who first collected these plants for Dinter, who described them a year later. Desmond Cole field number C187: This population is quite similar to the standard variety but with large pink bodies. 7) Bernd Schlösser (2000) “Lithops – Lebende Steine” Praktische Anleitung für die Zimmerkultur. Bussiness Point MEDIA.